If your order weighs less than 13 ounces, save huge on shipping with USPS first class (with tracking number). This product weighs 9.9 oz. Nature’s Sunshine Solstic Revive replaces vital nutrients lost during exercise, stress, exertion, dehydration, or malnutrition. Solstic Revive provides calcium, magnesium, sodium, and potassium to support joint and cartilage health, help rehydrate the body, support proper pH levels, aid in energizing the body, muscle recovery, and much more. 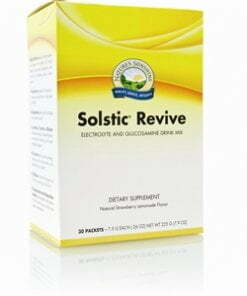 Nature’s Sunshine Solstic Revive is perfect for before, during and after any strenuous activity or as a refreshing beverage anytime throughout the day. 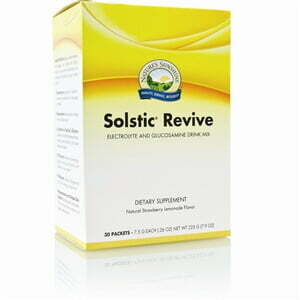 Instructions: Empty the contents of one Solstic Revive packet into 14–16 oz. of cold water, shake and enjoy! Fructose, chicory root fiber (Cichorium intybus), citric acid, D-ribose, natural citrus sweetener, sea salt, lemon juice powder, natural strawberry flavor, silicon dioxide (powdered silica), stevia leaf extract (Stevia rebaudiana), grapeskin extract (Vitis vinifera), pomegranate fruit juice concentrate (Punica granatum), L-carnitine, L-taurine, and L-glycine.